A summary of the experience gained by the establishment of a wild flower meadow in conjunction with the growing of fruit crops in North Suffolk. Experiences gained over many years growing various fruit crops and selling top quality fruit trees has highlighted various changes in the insect and bird population in and around orchards. These changes are also occurring in gardens, in spite of the fact that the micro climate in gardens is often much more amenable for many insects and birds. Good pollination for many fruit crops is vital for regular crops. Without the help of pollinating insects, regular crop production is a frequently-occurring problem. The problem is that most fruit crops flower early in the growing season, when it still can be very cold and wet. These are not the climatic conditions favourable or liked by many pollinating insects. Due to many factors, cherries, plums, greengages and pears, just to name a few, all flower from the middle of April onwards. This is a general statement. I have seen that due to warm conditions early on in the season, in February/ March, these fruit trees began to flower by the end of March/early April. But where were the pollinating insects such as bumble bees, hover flies and such like? Honey bees early in the season are often only around in low numbers. This is due to the fact that the honey bee is not likely to come out of the hive when the temperature is below 16 degrees Celsius. The bumble bee however is fully active from 10 degree Celsius. For good cross pollination we therefore have to rely on insects such as the bumble bee, when the weather is too cold for the honey bee. If nothing is done to encourage these wild pollinating insects to do their vital cross pollination work, while searching for food in the form of nectar and pollen, the fruit trees in question are unable to produce enough fruit , in the form of yield and quality. 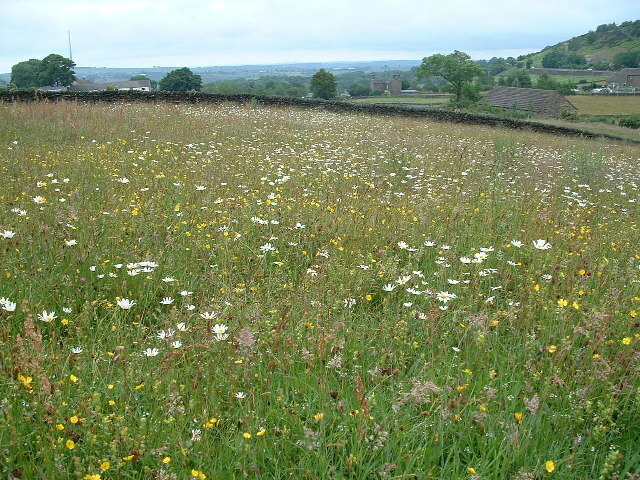 It is for that reason the establishment of wild flower areas is vital. Particular attention must be given to the choice of various flowering species. There has to be a regular food supply, in the form of flowering plants throughout the growing season. That means from March to some time in September. Only in this way lots of pollinating insects are attracted to build their permanent homes, in the immediate areas where pollination activities are needed, such as orchards. In our experience a combination of annual single blooms and regularly flowering shrubs is possibly the best method of providing adequate food for the pollinating insects. Another point is that it is better to have lots of flowers of a few species such as Dog daisies, primroses, lavender and clover, then a much extended range of species with just a few flowers on each shrub or annually flowering plant. However overall the most important requirement is to provide, for the full length of the growing season, enough flowers of plants and shrubs which are able to supply nectar and pollen, so badly needed for the insects to survive during the winter months. Buddleia, Lavender, Honeysuckle, Rosemary herb, Ivy, Lilac, Privet, Elderberry, and Buckthorn. 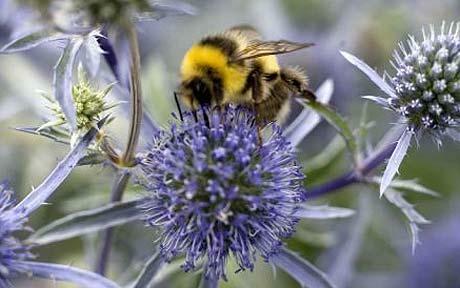 Most herbs are very attractive to bees. Clovers, Vetches , Cowslips, Primroses, Dog daisies, Yarrow, Yellow rattle, Knapweed, Red campion, Meadowsweet, and Plantain. Surrounding hedges with Blackthorn and Hawthorn , Bramble and Dogrose are very good for hover flies. To summarize, orchards are often a mono culture of species. Without a full complement of pollinating insects the fruit-setting capability of fruit trees is very erratic. Therefore a wild flower area with the right type of plants and shrubs is not only very attractive to look at. It also provides a balanced approach to the local environment as a whole.